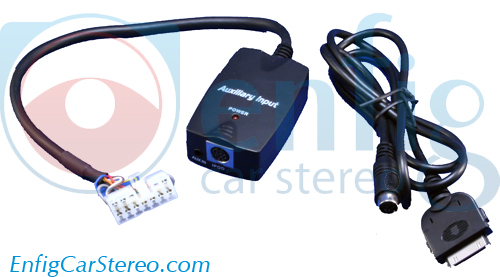 The iPod Auxiliary input adapter is designed to interface the audio outputs from devices such as XM and Sirius satellite radio receivers, DVD players, Digital music players, iPod, Games, ECT directly to your Toyota Factory audio systems. The iPod auxiliary input has 2 AUX ports: 3.5mm stereo jack and an 8 pin mini din iPod Specific port. Eliminates the use of noisy FM modulators. Charges the iPod while the radio is on. Dual Auxiliary Aux audio input.